Use these practical tips to propel you in your career as an S&C coach! ARE YOU WHERE YOU WANT TO BE IN YOUR S&C CAREER? 15 Action-Oriented tips to ensure that you leave no room for error when it comes to getting on the right track and fulfilling the career of your dreams. What am I doing that sets me apart from other coaches? In a competitive industry such as S&C, going the extra mile is no longer a choice; it’s a must. When it comes to setting yourself apart from the rest, you could look at general resources such as books, podcasts etc… but they are missing one key component. They aren’t centred around S&C coaches. This is why the following tips are so crucial. 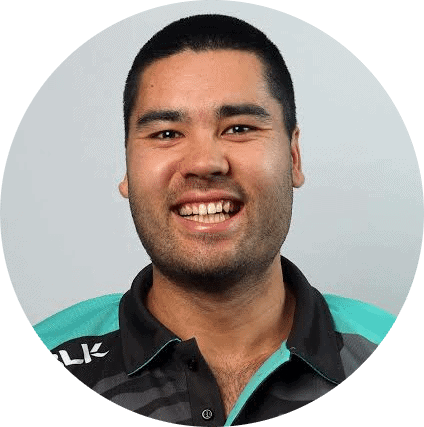 They will give you practical, implementable actions that are focussed around you as an S&C coach, not some generic points that have been regurgitated around the internet. Read them, implement them, and start ensuring that your dream S&C job can one day become your reality. The strength and conditioning profession is a world of sharing. From the many various articles, podcasts, and videos coaches share online (which are often done for free), to the conversations coaches have with one another, information is always being shared. A lot of this information isn’t just face value either, it is often in-depth to the point where you’d be able to implement the specific idea immediately. This level of openness and collaboration is, in my eyes, the true beauty of the strength and conditioning profession. Providing value to another coach without expecting anything in a return will help you build authentic, long-lasting relationships. Perhaps you are at the very beginning of your career and don’t feel you have much value to offer? Teaming up with coaches at a similar stage in their career is one way of providing value, as not all value has to do with sharing knowledge. Friendships built in the early stages of university will no doubt last a lifetime, and the value you provide each other through “trying to make it” as a strength and conditioning coach will be invaluable. For example, often just knowing what one another is going through when trying to find that first full-time job and sharing each other’s emotional rollercoaster will be hugely beneficial. As you gain more experience and knowledge, sharing your experiences with other coaches is a great way to build the authentic relationships mentioned in the previous points. Furthermore, gaining outside feedback on how you run your program can also help with critically-analysing what and why you are doing what you do from a different perspective. We are all trying to learn and improve, not just for our own sake, but for our athletes. As such, I believe critically analysing each other’s programs is an immensely useful strategy in order to add value to other coaches, build relationships, and develop your own skills as a coach. Action tip = provide value to other coaches in anyway shape or form you can possibly think of. If you believe in Karma, this is your opportunity to earn some of the good stuff. “If you don’t build your USP, you’ll just blend in with the other candidates and the employer’s choice will be left more to a “weighting factor” of skillset and personalities. You need something to leverage yourself above the rest of the candidates. For example, a couple of years after my time at Cardiff City FC and moving to Australia, I was offered an interview for the Nottingham Forest FC U21 Sports Scientist position. After researching the job description, the roles and responsibilities, and trying to analyse what they were currently doing, I decided my USP for that interview was going to be developing a more comprehensive load-monitoring strategy. This was part of our discussion in the Science for Sport exclusive members-only group on Facebook. 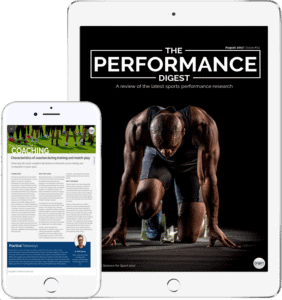 If you’re wondering how you can join, readers of the Performance Digest get this as an added benefit to their membership and get to connect and chat with over 1,500 likeminded coaches. This example goes to show that if you’re able to identify a need in an organisation that you can fill by presenting a solution, you have already shown that you’re of value and stood out over the other candidates. Go into an interview with the mindset to improve their organisational/athletic practises versus simply stating what you can do. Just make sure you also add character and build a relationship with the interviewers. Action tip = When you’re next applying for a job, use the job description and values of the company to develop a USP and lead with it. Make sure your resume is up-to-date, tidy, and free of grammatical errors. There’s nothing that will put an employer off more than a resume and cover letter that is full of spelling and grammatical errors, especially when it doesn’t take much effort nowadays with programs such as Grammarly. If you haven’t downloaded Grammarly yet, this is an absolute must for all your written documents. If you talk to many strength and conditioning coaches, many of them didn’t get their job through applying online with their resume and cover letter. More often than not, they’re put forward through another coach or management personnel or, if they are further down their career, their experience and skill as a coach is already known. Having said that, this does not mean that a resume isn’t needed for an experienced coach. A resume can back up and add further value to your current recommendation for the position. A resume should consist of more than just your job experience and qualifications. If you have published research, articles, blog posts, podcasts, or have extra-curricular qualifications, these all add value to your experience and shows you are an “expert” in the field. To make your job experience stand out, adding your responsibilities and/or the improvements you were able to make in physical capacities for the team or athletes you were working with are good quality pieces of information you can add. There is also discussion with how long a resume should be, and whilst it should be no more than 3 pages, the number of pages it is will entirely depend on how much experience, qualifications, and extra stuff you have completed. What’s more important than how many pages it is, is how well laid out and concise the content is. So, make sure your resume is concise and to the point, with your key information standing out. In regards to your cover letter, it must be personalised for the job you’re applying for, meaning you need to read the job description carefully. Even go as far as researching the organisation’s values so you can incorporate them into your cover letter. In addition to this, you need to portray your passion for that job and your eagerness to work for that company through the cover letter as well. If you struggle to do this, then perhaps this job isn’t for you. The more you can align yourself and the cover letter with the organisation and the job description, along with a strong resume, the greater potential you’ll have to get through to the interview process. Action tip= the resume should be concise, well designed, and with your key information standing out. The cover letter should be aligned with the job description, the company’s values and objectives, and it should also display your passion to work there. Whilst these 3 tips are essential, there are also 12 other crucial tips you need to know if you’re to even have a chance of getting your dream S&C job. Make sure you understand every single one and give yourself the best possible chance of succeeding. 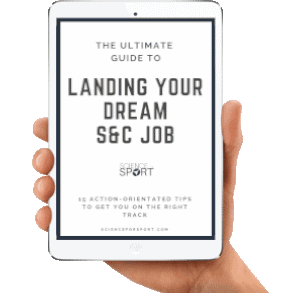 If you’re passionate about doing so, then click here to download your FREE “Ultimate Guide to Landing Your Dream S&C Job” ebook. In order to provide this high-quality content to you, we do use affiliate links to earn some very small commission if you decide to purchase an item via one of those links.